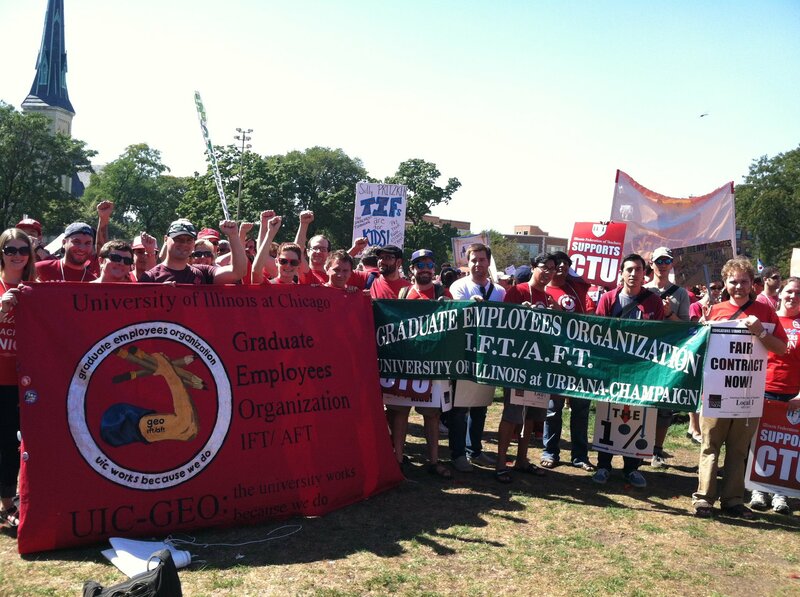 The primary objectives of the UIC-GEO shall be to serve as the bargaining agent for all graduate employees at the University of Illinois- Chicago and to create a culture of labor organizing among those graduate employees. The UIC-GEO believes in and will bargain for the ideas that all graduate employees should be paid a fair living wage, should receive comprehensive health care and retirement benefits, and should be free from unfair, unreasonable or dangerous work conditions. The UIC-GEO is also committed to promoting quality teaching and research at UIC, and, therefore, to fostering a sense of community among UIC graduate students. In addition, the UIC-GEO is committed to the principles of labor solidarity, social justice and participatory democracy and will give support to and work in coalition with labor or social justice groups on campus, throughout the Chicago area or internationally.